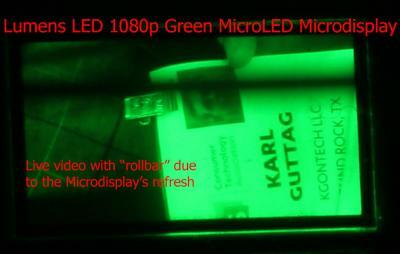 Korea-based Lumens demonstrated a new monochrome-green FHD (1920x1080) micro-LED microdisplay (silicon substrate) at CES 2019. Lumens is collaborating with the Korean Institute of Machinery & Material to develop Micro-LED production technologies and had plans to release its first monochrome 720p microdisplays by the end of 2017. but we do not know if these microdisplays are now available. For its 720p displays, Lumens says that the microdisplays provide a brightness of up to 100,000 nits, a high 10,000:1 contrast ratio, and a lifetime of 50,000 hours. The display consume 100 mW of power (probably depends on the image show, though) and are said to be almost 4X as efficient as OLED microdisplays.